June 9, 2018: The annual Hampton Classic Horse Show, one of the nation’s premier show jumping competitions, returns to Bridgehampton, NY, for its 43rd year, August 26 – September 2. June 9, 2018: The annual Hampton Classic Horse Show, one of the nation’s premier show jumping competitions, returns to Bridgehampton, NY, for its 43rd year, August 26 – September 2. The Classic hosts exciting hunter/jumper competition from junior levels up to the pinnacle of the sport, grand prix show jumping, featuring the $300,000 Hampton Classic Grand Prix CSI**** on Sunday, September 2. Sunday, August 26 – Leadline classes, Harmony Home Concierge Opening Day Ceremonies, the $30,000 Boar’s Head Jumper Challenge, and $10,000 Marders Local Hunter Derby highlight Opening Day at the Hampton Classic. Local hunter classes take place in other rings throughout the day as well as Children’s and Adult Equitation classes. Competition begins at 8:00 a.m.
Monday, August 27 – The Finals of the Long Island Horse Show Series for Riders with Disabilities will be the highlight of competition beginning at 10:00 am. Spectators are also invited to shop in the Boutique Garden or visit the Exhibition Tent. The Hampton Classic will host the 7th annual Adoption Day, another highlight of the day. Adoptable cats and dogs will be in the Kid’s area from 11:00 a.m. -2:00 p.m. and adoptable horses will be showcased in Hunter Ring 2 from 1:00 p.m. – 2:00 p.m. There is no admission charge on Monday. Competition begins at 10:00 a.m.
Tuesday, August 28 – Tuesday’s events include the $10,000 Open Jumper class, the $10,000 Brown Harris Stevens 7 & Under Jumper class, Platinum Performance/USEF Show Jumping Talent Search, Amateur-Owner and Junior Jumpers, Green Working and High Performance Hunters, and Children’s Hunters. The Short-Stirrup classes and Championships will take place in the Annex Ring. Competition begins at 8:00 a.m.
Wednesday, August 29 – Competition continues in Amateur-Owner, Junior, and Open Jumpers including the $10,000 Wölffer Estate Open Jumper classes, $10,000 Palm Beach Masters Open Jumper and $10,000 Bruno Delgrange 7 & Under Jumpers. Amateur-Owner, Junior, and Adult Amateur Hunter classes are also featured, as are the Green and High Performance Hunters and Children’s Hunter Classics. Competition begins at 8:00 a.m.
Thursday, August 30 – The week’s jumper competition continues with $40,000 Speed Stake, as well as Amateur-Owner, Junior, and Children’s Jumper classes including the Washington International Equitation Classic, Jumper Phase. Hunter classes will include Small and Large Junior Hunters, Adult Amateur Hunter Championships, and the $2,500 Adult Amateur Hunter Classic. USEF Adult Equitation and the Dover Saddlery/U.S. Hunter Seat Medal Qualifying class will also take place. Competition begins at 8:00 a.m.
Friday, August 31 – Friday features exciting events in the Grand Prix Ring starting at 8:00 a.m. including the $10,000 Junior/Amateur Welcome Stake, the $10,000 SHF Enterprises 7 & Under Jumpers Championship, and the $15,000 Speed Derby. The $75,000 Douglas Elliman Grand Prix Qualifier, scheduled for a 2:00 p.m. start, will set the participant list for Sunday’s $300,000 Hampton Classic Grand Prix. The schedule also includes Adult-Amateur, Amateur-Owner and Junior Jumper Championships. In the other rings, the Hunter classes will take place for Amateur-Owner, Junior, and Ponies, featuring Small and Large Junior Hunter Championships. Saturday, September 1 – Kids Day will feature plenty of activities for the entire family from 10:00 am-2:00 pm. Children under 12 are admitted free and receive a free pony ride. The Grand Prix ring will host both phases of the $10,000 Equitation Championship beginning at 8:00 a.m. and the $15,000 Carolex Junior/Amateur-Owner Jumper Classic followed by the big event of the day, the $70,000 LONGINES Cup at 2:00 p.m. The Jumper 2 Ring will host the $12,500 Amateur-Owner Jumper Classic, $12,500 Junior Jumper Classic, $5,000 Adult Amateur Jumper Classic, and $5,000 Children’s Jumper Classic. The other rings will host a multitude of Hunter championship classes for Amateur-Owners, Juniors and the $2,500 Pony Hunter Classic. Sunday, September 2 – The $10,000 Hermès Hunter Classic is among the featured competitions on Grand Prix Sunday. Festivities in the Grand Prix Ring begin with the $25,000 Jumping Derby followed by the awarding of the Amateur-Owner and Junior Jumper Championships. These events lead up to the grand finale— the $300,000 Hampton Classic Grand Prix. The winner of the $30,000 LONGINES Rider Challenge will also be presented. Further details are available on the show’s website at www.hamptonclassic.com. 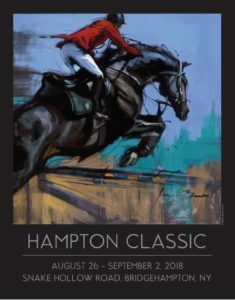 The Hampton Classic Horse Show, one of the most prestigious equestrian events in the country, has announced that Jennifer Brandon, of Waverly, Pennsylvania, has been selected as the 2018 Official Poster Artist.